Alex Luciano and Noah Bowman are bandmate buddies who met in New Paltz, a small college town in upstate New York. Together, the are Diet Cig, the self-described slop pop twosome who are steadily making a name for themselves in 2016. In the vein of Girlpool, Diet Cig takes a stripped down approach to instrumentation with Luciano playing guitar and singing and Bowman seated in back of the drum kit. The band’s five song EP Over Easy bursts at the seams with joyful energy while keeping it real with lyrics about living on your own for the first time (“Breathless”) and dealing with one-track minded scenesters (“Scene Sick”). 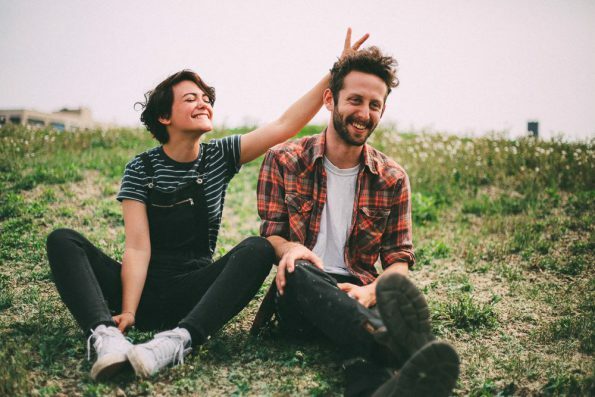 The effortless authenticity in Diet Cig’s sound will endear anyone who listens to their ultra-catchy anthemic tunes. Diet Cig are playing Shaky Knees Festival in Atlanta this weekend and will tour in the UK through May. Keep an eye and ear out for them! Check out their video for “Scene Sick” below. We dare you not to smile while you watch!